Funnyman Robin Williams committed suicide today after a long battle with depression, as well as a drug and alcohol addiction. Williams is survived by his three children and wife, Susan Schneider. Personally, I will remember Robin Williams as an impressionist. His most notable work being the live-action film adaptation of Popeye. He looked, moved and of course sounded just like the cartoon character, which was a bid deal for a kid. A close second would be his role as the irrepressible Army DJ in Good Morning, Vietnam. However, I believe the true measure of his successes is was in being an impressionists that other impressionists do impressions of. I specifically say “do” not “did” because I hope they never stop. 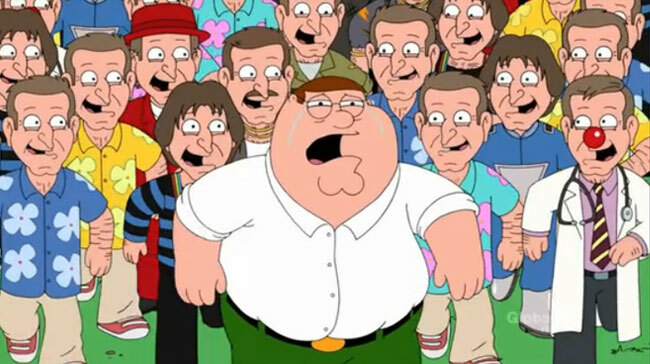 The iconic comedian made a cameo (voiced by Danny Smith) in the Family Guy episode “Family Guy Viewer Mail #2,” in which Peter wishes for everyone to be transformed into the Robin Williams after watching a comedy roast of the actor. Like King Lear, he rushes out into a storm and yells at heavens. His wish backfire as he’s overwhelmed by various characters portrayed by the actor. Peter tells them to disperse and spread their comedy across the country. He can’t help but keep a few, even at the cost of his sanity. Many comedians have aspired to imitate Williams including Jim Carrey, Simon Helberg and Frank Caliendo, who joked on Letterman that he would recast The Wizard of Oz exclusively with Robin Williams. How will you remember Robin Williams? BBC Three played the Family Guy episode moments before the news broke. A spokesperson said it was “just an uncanny coincidence.” It was scheduled to re-air Friday but they’ve decided to pull the episode, presumably because it features an attempted suicide by Peter. “The world just got a lot less funny. Robin Williams is a tragic loss,” tweeted series creator Seth MacFarlane.